The Pino Pascali Foundation is pleased to announce the winners of the 18th edition of the Pino Pascali Award, the Russian group AES+F composed by Tatiana Arzamasova, Lev Evzovich, Evgeny Svyatsky +Vladimir Fridkes. The Foundation will also give a historical presentation of the Pino Pascali Award. Saturday 19th of September 2015 at 7pm at the Pino Pascali Foundation in Polignano a Mare, we open the exhibition for the 18th Pino Pascali Award won by AES+F. This group of artists was created in 1987 in Russia, by the architects Tatiana Arzamasova and Lev Evzovich, the multidisciplinary designer Evgeny Svyatsky, and, from 1995, also the fashion photographer Vladimir Fridkes. The award giving commission, which includes Rosalba Branà, director of the Pino Pascali Foundation and the art critics Christian Caliandro and Antonio Geusa, have described the artists of AES+F as representative of an important innovation in the international artistic horizon, of a sort of poetry that sees the contamination of different forms of communication such as photography, video and digital technologies able to create a hyper-realistic and artificially visual metaphor of a very strong emotional nature. The important visual narrations told by AES+F explore the values, vices and conflicts typical of today’s society from a global point of view, with clear reference to the past history of Art. On top of ten photographs taken from well-known productions, the Pino Pascali Museum hosts the video Allegoria Sacra (Sacred Allegory) which will also be shown at the same time at the 56th Venice Biennale. The film lasts 40 minutes and is inspired by the painting of the Renaissance painter Giovanni Bellini, a work of art that is still today seen as enigmatic and mysterious and which, according to a number of art critics, represents an ideal path towards the purification of souls, identifiable with the passage from Purgatory to Heaven. Fascinated by this painting, AES+F have realized this third video after ‘Last Riot’ and Trimalcione’s party, shown at the Venice Biennale in 2007 and in 2009. Sacred Allegory is the final part of a symbolic trilogy about today’s world. (Hell, Heaven and Purgatory). 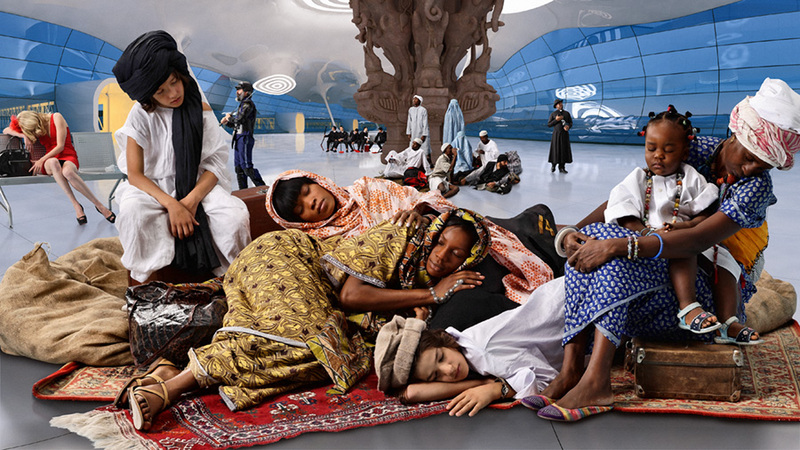 According to AES+F, the allegory of the Purgatory is represented by the image of a modern international airport, the place that best represents the feeling of lingering in time, waiting to “transit”, people united by a common desire to pass from one world to another. Christians, Muslims, Hindus, Jews, rich and poor, they hang around the airport listening to airport announcements and checking departure times, they all sleep next to each other despite being total strangers, they dream in a surreal atmosphere, a multiethnic community, a slice of the world with its contradictions. Nevertheless, despite this shared experience, everyone remains detached and protected in their own world. The idea of a happy multicultural community that can put aside religious and cultural differences in order to live together remains an unattainable goal. Sacred Allegory is the most rigorously conceptual work of AES+F. AES+F’s research work has been internationally acclaimed and the artists have been the main attraction of the 52nd Pavilion of the 2007 Venice Biennale with the work Last Riot (2007), the first of a trilogy of multichannel video installations of great proportions. The second work of the series, Trimalcione’s Party (2009), was presented in Venice in 2009, and the third, Sacred Allegory (2011), first appeared at the 4th Moscow Biennale in 2011. It can currently be found at the ongoing Venice Biennale. Together with The Liminal Space Trilogy, this trilogy was awarded prizes in September 2012 at the Martin-Gropius-Bau, Berlin and at the Moscow Manege. More recently, the trilogy was shown at the Museum of Fine Arts La Chaux-de-Fonds, Switzerland (June-September 2014) and at the Albright-Knox Art Gallery, Buffalo, NY (June-September 2015). The group AES+F received the Sergey Kuryokhin Prize in 2011, the Kandinsky Prize in 2012 and the Festival Nordart Prize in 2014 for the project Sacred Allegory. In occasion of the Pino Pascali Prize, the Pino Pascali Foundation presents a historical overview of its prizes from 1997- the year in which the director of the museum, Rosalba Branà, re-introduced the initiative after a twenty-year hiatus – until today. Closely following the original set of rules established by Palma Bucarelli, the prize is granted every year to an artist, or a figure in the world of art, who is chosen internationally from a shortlist of suggested names by a commission of experts, art historians and critics and is nominated every year by the director of the Museum. From the 19th of September the Museum also exhibits works of artists and protagonists of the most recent editions. The Pino Pascali Prize was awarded from 2014 to 1997 to: Fabrizio Plessi (2014), Mat Collishaw (2013), Nathalie Djurberg (2012), Bertozzi and Casoni (2011), Jake & Dino’s Chapman (2010), Jan Fabre (2008), Adrian Paci (2007), Lida Abdul (2006), Studio Azzurro (2005), Marco Giusti (2003), Giovanni Albanese (2002), Achille Bonito Oliva (1997).